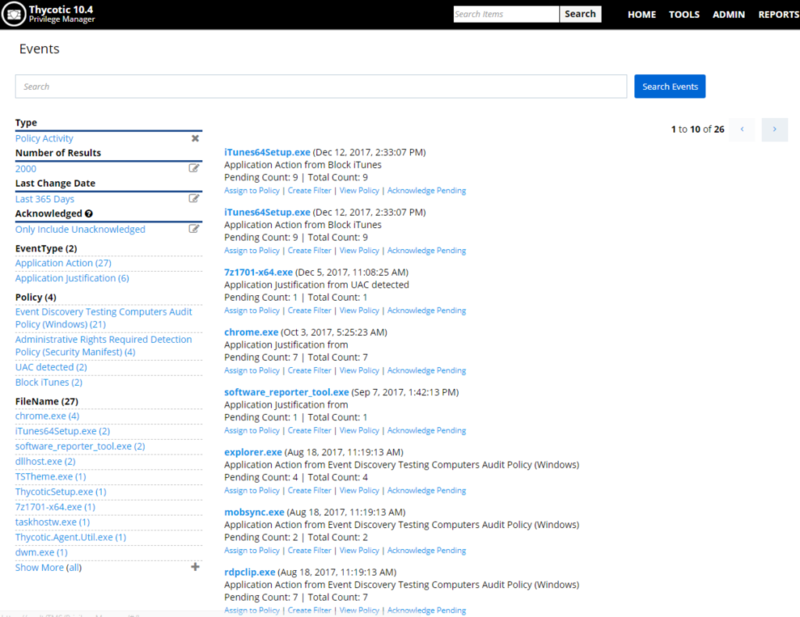 Successful application control demands that you have a complete, real-time understanding of the status and activity of all endpoints. 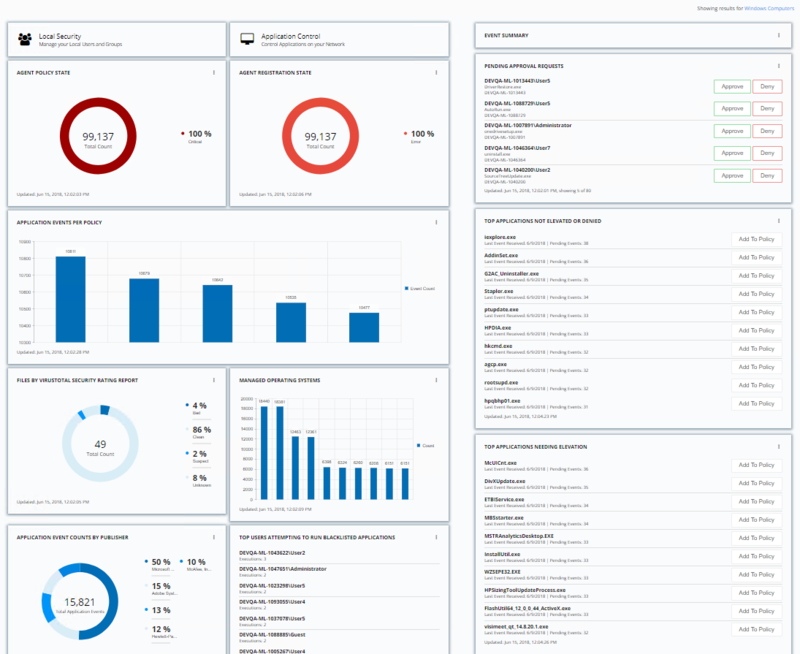 Privilege Manager provides a unified reporting dashboard so you can quickly evaluate the status of endpoints, review activity logs and event data, and access a broad library of reports. Responsive and fully configurable, Privilege Manager’s dashboard reporting enables you to quickly drill down into reports across any dimension (time, geo-region, OS, status…) to evaluate activities and trends. From the dashboard you can also set up automated alerts to stay informed of potential problems. Privilege Manager can record all executable events on managed endpoints so you can review, search, and analyze these logs in a unified manner without leaving the console. The ability to audit and review the activity of local users and groups is essential to retroactively identify problematic activity and reduce risk. 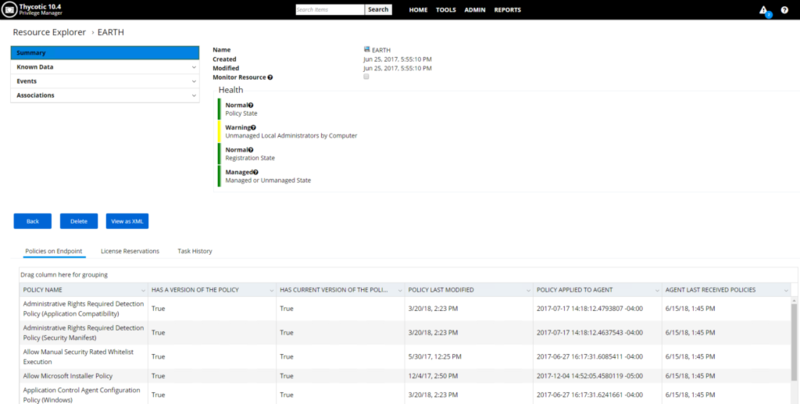 Privilege Manager lets you swiftly review and search across all User and Group activity associated with privilege escalation on every managed endpoint. The lightweight Privilege Manager agent is a critical component of Thycotic’s application control, giving you the ability to evaluate the health and status of agents in real time. Privilege Manager provides pre-configured and fully customizable reporting on the status of agents and endpoint operating systems. In the Privilege Manager reporting dashboard, you can drill into reports based on any dimension and easily export report data to other reporting applications or Excel. Privilege Manager’s ability to quickly generate fully customized reports and schedule the execution and delivery of these reports is essential to maintaining a real-time understanding of every aspect of your least privilege program.